Everton boss Roberto Martinez expressed his "immense pride" for the club's "incredible" fans as up to 10,000 travelled to France for the Europa League goalless draw with Lille. The Toffees sold out of their 5,274 allocation, with thousands more fans making the journey without a ticket. Some were targeted with tear gas fired by police during clashes in Lille's main square before kick-off. "The support doesn't stop amazing me - it is incredible," said Martinez. Asked about specific incidents of trouble, Martinez added: "I heard something was reported, but don't know any details about it." A spokesman for Merseyside Police, which had liaison officers in Lille, said trouble started when French police chased someone into the square where Everton supporters had congregated. The spokesman confirmed CS gas canisters were fired. 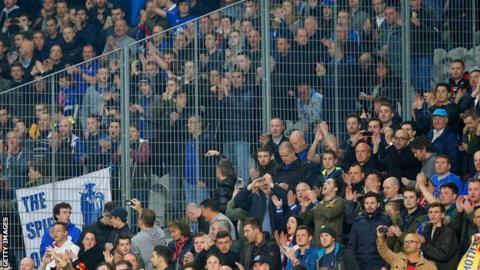 French authorities had banned Everton fans without tickets from the city centre. Calm was restored and fans, who had been cleared from the square, were allowed to return. Speaking about the size of Everton's support, Martinez said: "I have seen full families coming across, some without tickets just wanting to be near the hotel and wish the players well. "It really meant something for thousands of them, and you keep getting closer to understanding what the Evertonians deserve. "I would say this will be an incredible memory and that we will be talking about this trip for a long time." Everton officials said it was their largest support for a European match since the 1985 Cup Winners' Cup final in Rotterdam. The draw left Everton one point clear at the top of Group H, with two of their remaining three group games at Goodison Park. Everton are unbeaten with five points from three games ahead of their next match in the competition at home to Lille on 6 November.